If you're considering a Boxster S with options, be sure to price out a similar Boxster GTS, because the top trim might turn out to be cheaper. The 2015 Porsche Boxster is a relative performance bargain, combining everyday usability with a balanced chassis and sweet engines. Porsche’s Boxster is, and continues to be, one of the most utterly joyful cars to drive in Porsche’s lineup—and in the whole car world. Among a list of models that includes the Cayman and 911, that makes the Boxster a true standout, and while it’s not exactly cheap, it is one of the best sports car performance values on the market. There are only a handful of changes to the Boxster for 2015. A wind deflector is included as standard equipment, and there are a few new options, including a new rearview camera that comes with packaged with front and rear parking sensors, a 20-inch 911 Turbo wheel design, and automatic high beams as part of the Bi-Xenon lighting package. There are also some minor interior trim tweaks, an available Black/Garnet Red two-tone leather interior, and two new exterior colors: Jet Black Metallic and Carrera White Metallic. The Boxster GTS arrived as a late addition to the lineup last year, and resembles a Boxster S with many of that car's options included as standard equipment. Unique items include a higher-output version of the Boxster S's 3.4-liter engine (330 hp, 273 lb-ft), different front and rear fascias, and a GTS-specific interior package. Standard features include the Sport Chrono Package, Alcantara all over the interior, black window trim, big wheels, Porsche's adaptive suspension, and much more. All in all, it's about $14k in add-ons, plus the extra power you can't buy, for only $10k more than a Boxster S.
Two other mid-mounted engines are available in the Boxster, matching the two primary trim lines: Boxster and Boxster S. The base Boxster gets a 2.7-liter flat six-cylinder engine rated at 265 horsepower. Capable of 0-60 mph runs in just 5.5 seconds and a top speed of 164 mph, even the entry-level Boxster is quick. The Boxster S adds 50 hp for a total of 315 from its 3.4-liter flat six-cylinder engine. The extra power cuts 60-mph acceleration to just 4.8 seconds elapsed and enables a top speed of 178 mph. All models come standard with a six-speed manual transmission, but a dual-clutch seven-speed PDK paddle-shifted automatic is also available. Add in the Sport Chrono package, which includes launch control (on PDK-equipped models), advanced racing-inspired shift logic for PDK models, and dynamic transmission mounts, and you have the most inspired version of the Boxster--as well as the one that rips off the quickest claimed 0-60 mph times. Electric power steering has been a hot topic amongst enthusiasts, with early versions from some carmakers providing synthetic, unnatural feedback--if they provided any at all. Fortunately, the Boxster does not suffer for its EPS system. In fact, if you didn't know it was electric, you might not notice. It's not the same as it used to be, but it's still very communicative and intuitive. The same could be said of the Boxster's handling; it's a well-balanced, easy-to-drive-fast roadster. It's also incredibly fun to drive, with the motor singing just behind the seats (but not unbearably so when just cruising), the wind blowing through the cabin, and a long, winding road laid out before you. Ride and comfort are also very good, especially in models equipped with the adjustable suspension. A set of buttons in the center console provide sportier settings on top of the standard mode, which modify ride quality (and several other parameters) to suit the driver's mood. When the driver isn't pushing the limits, the Boxster is actually quite reserved, cruising smoothly and quietly, just as a daily driver should. The optional adaptive suspension helps keep things comfortable, even when set to one of its more aggressive modes. Seating space is good for the two occupants the Boxster holds, with plenty of leg, shoulder, and head room even for a six-foot-plus frame. Storage space in the cabin is rather limited, as a result of the mid-engine configuration, but the trunk area holds small to medium-sized bags. 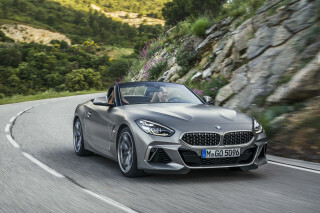 The convertible top (still a soft top, unlike much of the competition) can raise or lower at speeds up to 30 mph, and takes no space away from any cargo area. For the sports car aficionado with a taste for the finer, higher-tech things in life, the Boxster is a smorgasbord of standard equipment and available options. All Boxsters get driver and passenger electric-adjust seats; rain-sensing wipers; heated exterior mirrors; ambient lighting; cruise control; Bluetooth hands-free phone integration; a power-folding soft top; and more. Available extras include: a Bose surround sound audio system; a 7-inch touchscreen navigation system with infotainment; a range of available custom interior and seating packages; and many other a la carte technology and convenience upgrades. Neither the National Highway Traffic Safety Administration (NHTSA) nor the Insurance Institute for Highway Safety (IIHS) have crash-tested the Porsche Boxster, which is common for cars on the more expensive, less common end of the spectrum. Despite the lack of crash-test results, the Boxster's standard ABS, advanced Porsche Stability Management stability and traction control, rollover protection, and full suite of front, thorax, and side airbags should comfort safety-conscious buyers. On the green front, the 2015 Porsche Boxster scores 20 mpg city, 30 mpg highway when equipped with the manual transmission; with the PDK those figures rise to 22 mpg city, 32 mpg highway. The more powerful Boxster S rates 20 mpg city, 28 mpg highway with the manual; the PDK earns the Boxster S ratings of 21 mpg city, 30 mpg highway. And at the top end, the Boxster GTS returns 19 mpg city, 26 highway with the manual and 22 mpg city, 31 highway with the PDK. The Boxster is the quintessential Porsche sports car, with lovely echoes of classic Spyders. 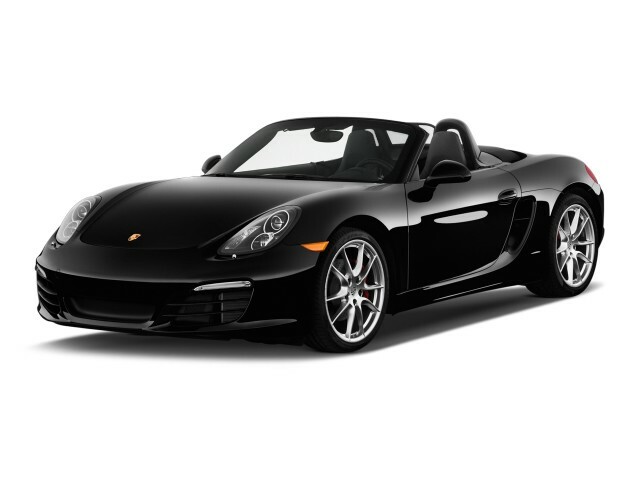 The 2015 Porsche Boxster offers two new exterior paint colors--Jet Black Metallic and Carrera White Metallic--as well as a new Black/Garnet Red two-tone leather interior. 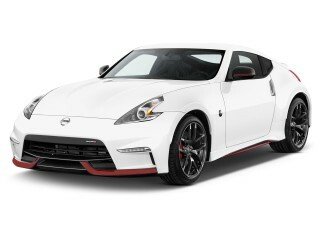 Otherwise, it is visually identical to the 2014 model. The latest Boxster drops the more flowing, feminine lines of its predecessor for an angular and muscular look. 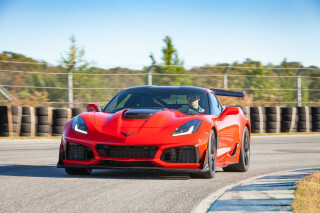 The front and sides of the car are the areas of the most dramatic visual changes, with more aggression and fortitude expressed in the sharp angles and large (functional) air scoops. In the rear, an integrated spoiler bridges both fenders and includes the third brake light. Inside the Boxster's cabin, materials and layout are generally excellent, with leather-wrapped surfaces, quality switchgear, and a clean, linear control set that makes perfect sense--once you figure out what all of the buttons do. As with other Porsches, there are plenty of options available to personalize the look of the interior and exterior. The Boxster's thrilling acceleration, uncanny grip, and excellent steering elevate the sports-car game for all comers. The 2015 Boxster offers three different trim levels, each with its own engine spec to accompany it. 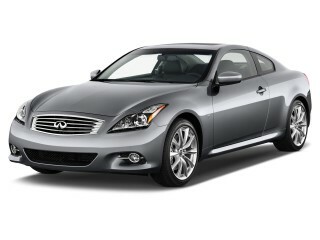 Base models start with a 2.7-liter, 265-horsepower flat six-cylinder engine. 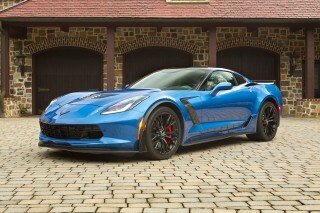 In the right configuration, this model can hit 60 mph in 5.2 seconds and a top speed of 164 mph. The Boxster S gets a 3.4-liter, 315-horsepower flat six-cylinder that moves the car to 60 mph in as little as 4.5 seconds and on to a top speed of 173 mph. At the top of the range is the Boxster GTS, which uses a 330-hp version of the S's 3.4-liter; it's good for a 4.4-second trip to 60 mph and a top speed of 174 mph. A six-speed manual transmission is standard on all models, while a seven-speed PDK dual-clutch paddle-shift automatic is an option. 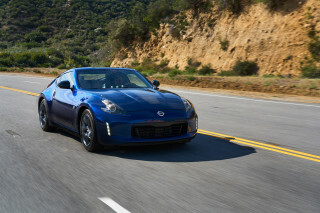 The manual is a smooth, slick-shifting unit, and the PDK transmission is one of the better dual-clutch transmissions available; it does a nice job balancing sport when you want it and comfort when you don't. That's not to say the Boxster is somehow compromised; it's anything but. 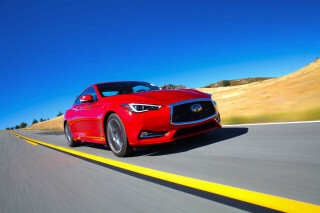 In fact, it's the best of its segment and beats some higher-priced and more powerful cars in the eyes of some, both in terms of sport driving dynamics and during the daily grind. This balance comes from the well-tuned chassis, mid-engine layout, and Porsche's unique brand of engineering and style. The Porsche Active Suspension Management (PASM) system, optional on lower trims and standard on the Boxster GTS, further broadens the car's range. It can be adjusted from normal settings to Sport and Sport Plus modes, again giving drivers the choice of a comfortable or more sporty ride. A Sport Chrono package is available (it's required along with the PDK transmission to get the fastest factory-claimed 0-60 mph times), adding dynamic transmission mounts and a more aggressive race-inspired shift logic for the PDK transmission when the Sport Plus mode is engaged. Electric power steering is often maligned for lack of feel and artificial feedback, but those types of complaints are few with the Boxster. The steering isn't as good as the best hydraulic and manual systems we've driven, but it's close--certainly close enough to enjoy the Boxster's balanced handling on a good road. And since Porsche had some time after the latest 911 launched with its first electric steering system, the Boxster benefits from some improvements that resulted from feedback. Steering is light, like in most Porsches, but it's very accurate and nicely weighted. A well-outfitted two-seater, the Boxster has myriad trim options, wonderfully supportive sport seats, and dual trunks. The latest Boxster improves on all of the faults of the previous model, making a quieter, more comfortable cabin with better materials and more standard and available equipment. The Boxster retains its soft top, unlike most of its competition, and reaps certain benefits, including light weight, minimal consumption of storage space, and the ability to open and close at speeds up to 30 mph. The top is electrically operated, with no manual latches do worry about. 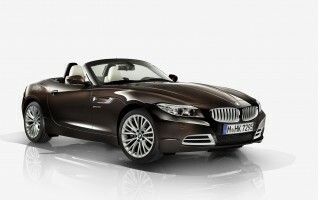 Of course, a soft top isn't as robust or secure as a folding hard top, but we think the benefits outweigh the demerits. 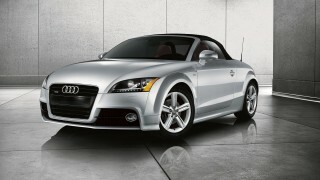 Seats are comfortable, with generous room for a compact two-seat sports car. There's enough adjustability to suit the vast majority of body types and heights with the base seats, while optional versions carry power adjustment of lumbar, thigh bolsters, and side bolsters. There isn't much space to stow gear in the passenger compartment, and the two trunks (one up front, one out back) split their combined 10 cubic feet of cargo space, limiting the size of items that can be transported. It's best to pack in soft-sided luggage, as some hard suitcases can't be made to fit the trunk shapes. While noise from wind, tire, and engine sources have all been reduced in the Boxster, it's still a mid-engined sports car, which is to say, when you're pushing the car hard or driving near triple-digit speeds, you'll be bathed in the sounds of the car at work. When not so close to the bleeding edge, however, the Boxster's overall volume is greatly reduced compared to the previous version, especially with the top up. And even with it down, and the new standard wind deflector in place, it's not difficult to carry on a conversation with your partner in the cabin. A seven-inch high-resolution touch screen gives access to audio, navigation, and other Porsche Communication Management systems. Recent improvements have made this system much more intuitive and user-friendly, although it's still not an industry leader in terms of features or interface quality. It's accompanied by a circular color screen in the gauge cluster, which can show things like navigation instructions, trip computers, and audio information. No crash-test scores exist, but the Boxster comes with lots of standard and available safety technology. The 2015 Porsche Boxster hasn't been crash-tested by either of the major American safety organizations, the National Highway Traffic Safety Administration (NHTSA) and the Insurance Institute for Highway Safety (IIHS). This is common practice with low-volume vehicles like the Boxster, because the expense of destroying several cars to obtain ratings is tougher to justify. This doesn't mean it's unsafe, just that we don't have standardized results to compare it to other more mainstream models. Porsche has engineered a great deal of safety into the Boxster, starting with a rigid chassis; dual front, side, curtain, and thorax airbags; anti-lock brakes; and very capable stability and traction control. The fantastic handling can also be counted as an accident-avoidance feature. Top up or down, visibility is very good in the Boxster, though shorter drivers may find it more difficult to see over the rear quarters. The 2015 model year is the first in which a rearview camera will be offered on a Boxster. It is bundled with front and rear parking sensors under the name ParkAssist. With base prices in the $60,000 range, it can be a shock to order a well-fitted Boxster S with a sticker approaching $90,000. There's no shortage of standard equipment on the 2015 Porsche Boxster, with convenience and technology items you'd typically find in a mid-range luxury sedan, rather than a sporty roadster. Standard items include: driver and passenger seats with electric backrest adjustment; Bluetooth audio; USB and iPod input; SiriusXM satellite radio; cruise control; ambient lighting; heated exterior mirrors; and a power-operated soft top. The list of optional extras can fill books, with some of the highlights being the seven-inch touchscreen navigation display, a leather upgrade package, a Burmester high-power audio system, 18-way power seats, and a host of wood, leather, carbon-fiber, and Alcantara interior trim choices. The easy part is customizing a Boxster to suit you; stomaching the extra cost of those --which can easily reach five figures--can be slightly more difficult. Changes for the 2015 model year include a newly standard wind deflector and the availability of a rearview camera, which is being bundled with front and rear ParkAssist sensors. This is the first time a rearview camera is being offered on a Boxster. There are also some new interior and exterior color options, as well as availability of 20-inch 911 Turbo wheels. For such a single-minded performance vehicle, the Boxster's fuel economy is quite good. Considering its performance capabilities, the 2015 Porsche Boxster is rather efficient. There are of course greener choices for the money to transport two people, but very few that offer the fun or luxury of Porsche's mid-engine roadster. The base 2015 Boxster scores 20 mpg city, 30 mpg highway when equipped with the manual transmission; with the PDK those figures rise to 22 mpg city, 32 mpg highway. The more powerful Boxster S is rated by the EPA at 20 mpg city, 28 mpg highway with the manual; the PDK earns the Boxster S ratings of 21 mpg city, 30 mpg highway. And at the top end, the Boxster GTS returns 19 mpg city, 26 highway with the manual and 22 mpg city, 31 highway with the PDK. This Porsche creates the most fun I have ever had in a car. Great, unbelievable quality. Awesome sounding exhaust. PDK transmission is unbelievably efficient. Beautiful lines. Looking for a different year of the Porsche Boxster?